“We want to make these people feel like this place is their own, to give them the opportunity to do things they can't do in their daily life." It's a regular Wednesday evening and I am in the metro, on my way to Monastiraki station in the historical centre of Athens. I am going to the social centre synAthina, where the paths of many Athenians meet. 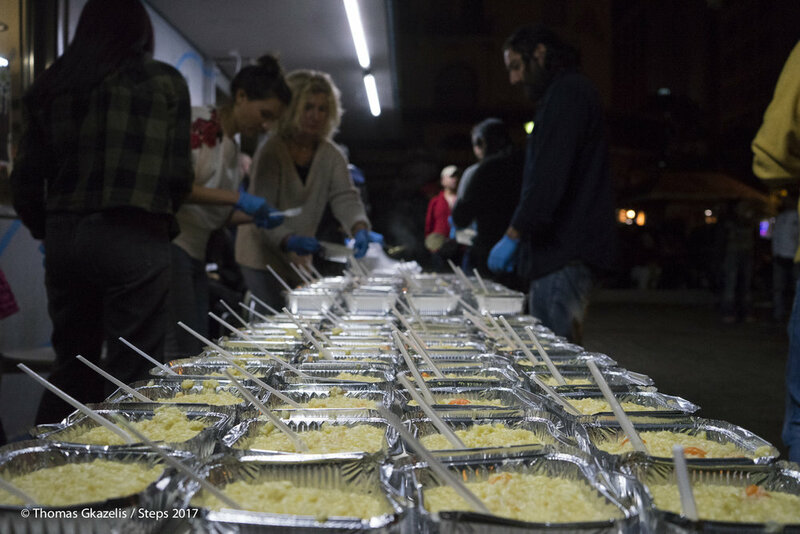 Steps, in collaboration with other NGOs, offers a free meal there every Wednesday and Sunday afternoon, for anyone who needs it. The program is called One Stop. It's a place where people of the street can stop by and take a break from their everyday struggles. Many people are gathered around the synAthina centre. Homeless, refugees, drug addicts and passers-by chat while the volunteers cut vegetables and turn on a gigantic stove. The dish of the day is pasta with vegetables. But these 50 or so people are not just waiting for a free meal. Hot beverages – coffee and tea – are served. The music playing creates a festive atmosphere. A hairdresser has come to cut people's hair and trim their beards. The NGO Ithaca is present with their laundry van, where people can wash their clothes for free. Inside synAthina, doctors examine wounds and treat the ill. A couple of social workers are also around to give legal and administrative advice to anyone who needs it. One Stop provides a place for people in need to get some of the basic things they lack – even if this is only twice a week. Food is central to One Stop. But it is “not our mission in itself,” says Steps coordinator Tassos Smetopoulos. He counts years of experience in social streetwork and is considered one of the sector's veterans. “[Food] is what we use to meet these people, to bring them together,” he says. "You don't find people in danger of dying from hunger in Athens” he tells me. Greek society, he explains, is one that has a special relationship with nutrition. Greeks are extremely proud of their hospitality, celebrated throughout ancient history. What is more, Greek eating culture differs from that of Western Europe, as it is based on sharing. You rarely get a main course for yourself in Greece. In such an environment, those who are hungry will probably find a way to feed themselves. “But there are many people who don't eat well. And this, along with other things, might cause pathological problems,” says Tassos. “At One Stop, we don't cook just to feed. We offer something with high nutritional value, using good ingredients.” At the end of the day, what Tassos and Steps try to create every Wednesday and Sunday evening is the feeling of being at home, and a sense of belonging. “When you go to a friendly house, what do you do?” Tassos asks rhetorically. “You get together, you sit down, you talk. If you get hungry, you will cook and eat together. In the end, you might even take a nap,” he says. “We want to make these people feel like this place is their own, to give them the opportunity to do things they can't do in their daily life.” And if Wednesday is just another weekday, Sunday is more significant – especially in Greece where, traditionally, it's a day for families to gather, share a meal and talk. One Stop is trying to recreate just that for those who don’t have this luxury. Since it launched in May 2016, One Stop has offered around 20,000 portions of food, and the project continues to evolve. Tassos envisions a bright future for One Stop: The idea is to start getting the beneficiaries more involved. First, they could serve their meal by themselves. Then, they could start participating in the cooking. “It could become the beginning of someone's professional life. It is not unimaginable to get a job in a restaurant. It is not impossible to build a partnership with a cooking school, so that one or two people get a scholarship to take classes. If there is a kitchen, these people could cook for themselves and for others in the neighbourhood,” Tassos explains. Tassos strongly believes that One Stop can change things not just for those in need, but for society at large as well: “There is a kind of trickery in all this [offering help to people in need]” he says. “The trickery is that I know that once you come to contact with it, either it will kick you out or it will keep you close. And once you’re in, you’re hooked and it changes you,” he adds. “An internal dialogue begins [inside you] – and this passes on to your environment. So, if you do something, a friend might develop an interest in what you are doing. And they might join. And then a friend of the friend might do the same. If this is multiplied, there is potential for something great,” he tells me. In modern Athens, where austerity and the economic recession rule, glimmers of hope nevertheless persist. They come alive through something we all have in common: the need to eat. Food has the potential to act as the glue that holds a society together. Whether this is a family lunch on a Sunday afternoon or a common meal on a cold Wednesday evening, food is the only thing that can gather heterogeneous groups over a bubbling pot and put a smile on their face. It's a small victory, but it's a start - potentially one that can have ripple-like effects, according to Tassos. Even if it's only twice a week. PETROS KONSTANTINIDIS goes around Europe and the Middle East with an empty stomach. Hungry for stories and experiences, he's trying to make his way into journalism. For now, he eats souvlaki, but a kebab or a falafel works too.